Previewed at: UPI theatrette, Sydney, on 20 March 2019. Making a follow-up to a debut film that was a critical and box-office success is just as difficult as the ‘second album syndrome’ that is a recognised phenomenon in the music industry. 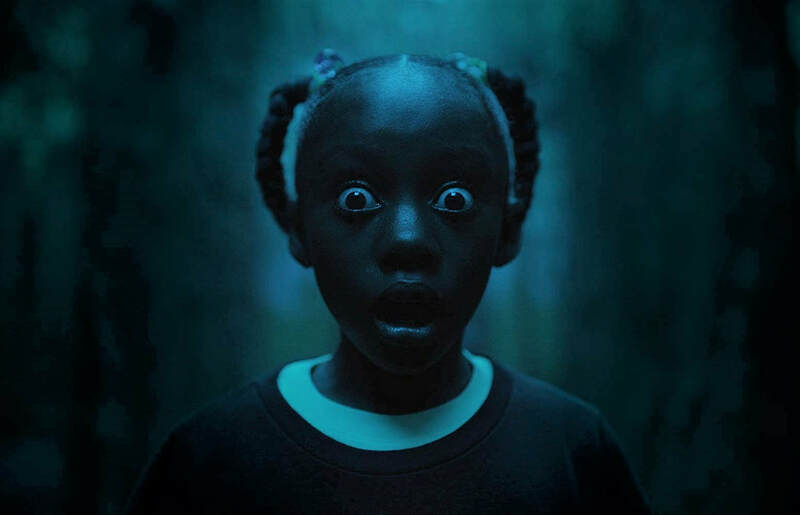 In this case, Jordan Peele has almost pulled it off but, it has to be acknowledged, Us doesn’t quite reach the psychological heights of Get Out although the director/writer has given it a red-hot go. The same social conscience is evident in this sophomore movie’s sub-text, it’s just not as overt as it was in the first film... and a bit more perplexing. Peele’s wild sense of humour is still there though - amped up, if anything. A lot of Us will have you chuckling as much as cowering. It’s a great idea for a horror film and it’s certainly not the first time that doppelgängers, doubles or look-alikes have been the basis for a movie plot; they are often harbingers of something terrible about to occur. The principle cast members seem to have had a great time playing good and bad versions of themselves, especially Nyong’o, who’s simply extraordinary as the sweet, loving Adelaide and her terrifying alter ego, Red. Her face and voice change dramatically but it all seems to be down to her acting abilities, rather that cinematic trickery. The 13-year-old Shahadi Wright Joseph is very creepy, too, as Umbrae, her evil double. Winston Duke gets most of the comedic lines; his Gabe is a chilled kind of guy who has trouble accepting the weird things going on around them. Once again, as in Get Out, the suitably eclectic score has been provided by composer Michael Abels, and it’s an important element of the film. The screenplay is solid for the most part but the twist at the end is not entirely satisfying. One thing that’s unusual about it though, at least for an American movie, is that, when the slaughter begins, there’s not a single use of a firearm. Now that’s original! Talking about the genesis of his idea for Us, Peele says, “At some point I ask myself, ‘What’s the scariest thing for me, personally?’ In this case it was the idea of seeing myself. And then I think about what that’s really about, about why seeing yourself is so scary. No one really wants to look at their faults, their guilt, their demons. We all want to look elsewhere.” He goes on to explain this is a notion that is an endemic part of American culture (although not confined to the USA: the inclination to project people’s fears, anxieties and anger outward on to ‘The Other’ is widespread in Australia, too). “This country, and how this country looks at the world, we have a fear of the outsider,” Peele says. “It’s built into the fear of everything from terrorism to immigration.” Put another way, when we take a good, long, hard look at ourselves, we may just not like what we see; kind of like the warped reflection we see when we walk into the Hall of Mirrors at the Easter Show. Is that Us?